evangelizing the (digital) natives : The Day 2nd Hour Functions "Got" It. The Day 2nd Hour Functions "Got" It. Contrary to some teachers worst fears (and, I suspect, most "old-timers"), I long for the day when students and their parents figure out that I don't have all of the math knowledge they could ever need in their lives. I try to promote this by encouraging my students to search YouTube.com, BrightStorm.com, or khanacademy.org when they're at home and need additional tutoring, and by also encouraging them to help each other. I even introduced a new standard in my gradebook this semester that aligns to peer-communication and presentations. (Although I have yet to make good on my promise to use it). Tuesday was one of those days where the "sage on the stage" was behaving quite un-sage-like. I wasn't very well prepared for the lesson because I had needed to have a conversation with our precalc teacher before school about the necessity of one of the lessons I was thinking of doing this week in terms of preparing my students that will be going on to him. After probably 10 minutes of word-stumbling and some ineffective instruction, one of the kids said, "Hey, why don't we just get a YouTube video?" Ding! "Great idea!" I said, as a ran over to the computer to search the channels of some of our favorites. The rest of the period went much, much better as we watched a few videos and I served as expert tutor/guide instead of guest lecturer mathematician. Thinking back to those "old-timers"... ...maybe they would just say that I need to have my lessons more prepared and that this was proof of the ultimate teacher #FAIL, but I see it as evidence of learning. When the sage on the stage paradigm fails, my learners are finally free to explore and trust their intuition. When I wrote this post three years ago, I was so very excited for my students because I knew that they not only knew that there were other resources, but that many of them had the initiative to go and get them. The "peer communication" standard I referenced above was directly inspired by one of my students that was constantly asking for more resources she could use at home, and then went home and used them. I'm feeling nostalgic for this class today, because I have a hand full of students this year that refuse to take any initiative to look up things for themselves. Basic, DOK 1, reference type things. I had a student stay after school yesterday to work on our Google SketchUp project that was moving on to finding the area of the swimming pools on his design. In the span of 10 minutes, I think he asked me the area formula for a circle 3 times. While he was sitting right in front of a computer with a Google search tab open. 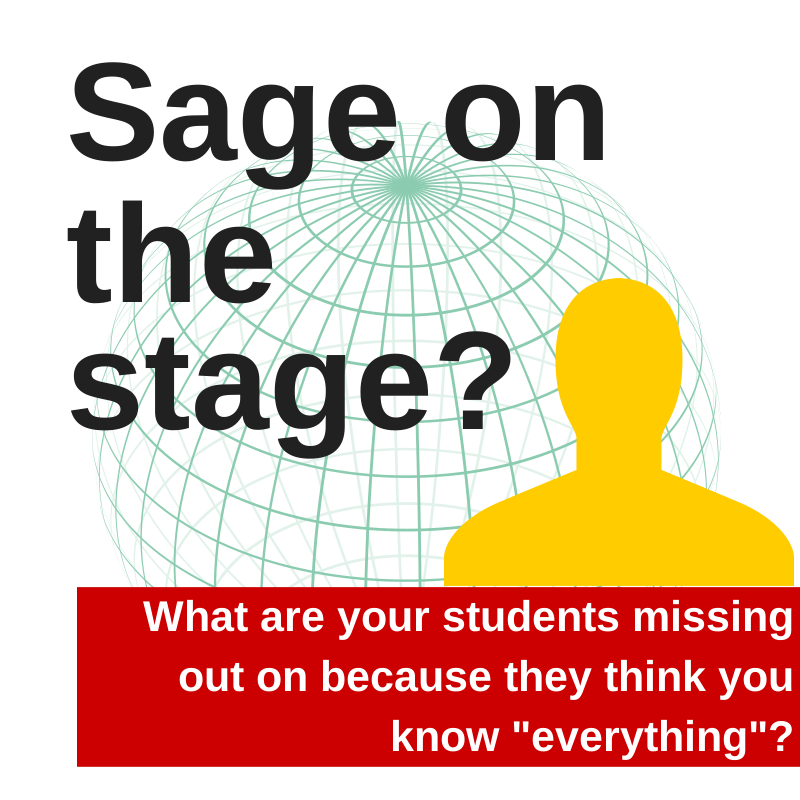 So to answer the question on the graphic above, when your students think that you know "everything" and can (or must) be their only source of knowledge, they miss out on any ability to explore their world! Think back to the first time you found an encyclopedia and just sat on the floor, reading some, looking at all of the pictures. As that small kid, I remember feeling like I now knew everything, because I could look it up. I (thought I) could explore the answer to any question I could think up, and this was pre-Internet! Is this student an isolated case, or do some "digital natives" take the collective knowledge of the web for granted to such an extent as to IGNORE it?